I had a lovely Christmas and am so excited that I can start to share some of the things I've worked on in the past month or two! First, I thought I'd show you our Christmas table that my sister and I (quickly) put together. Our theme was "silver and gold." 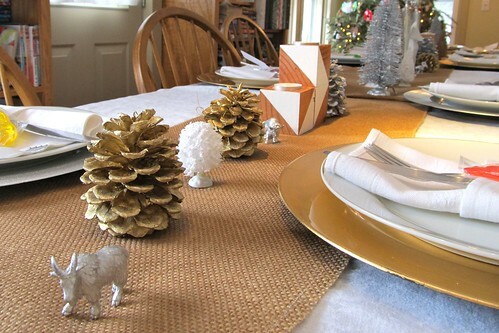 We reused the burlap runner from our Thanksgiving table and jazzed it up a bit by spray painting it gold. You may not be able to tell in the pictures, but it had a nice gold shimmer to it. The spray painting was so easy and quick, which was good considering we did it on Christmas Eve! We especially loved how the animals turned out! "Wow, what else can we spray paint silver and gold!?" 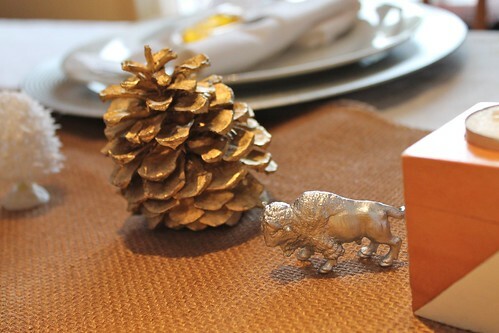 The white fox of course made its second appearance, looking quite dapper in the center of the table. 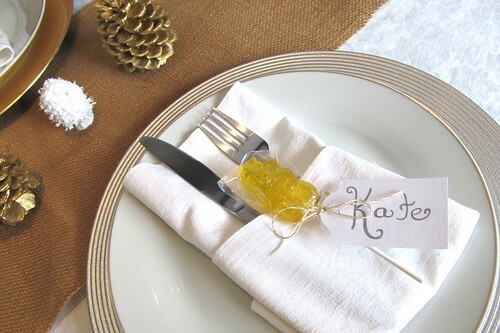 For place holders, we used delicious handmade lollipops from my sister's mother-in-law. I think they may just have to become a new holiday tradition! -"Silver and Gold" song written by Johnny Marks (for Burl Ives) for Rudolph, The Red Nosed Reindeer. 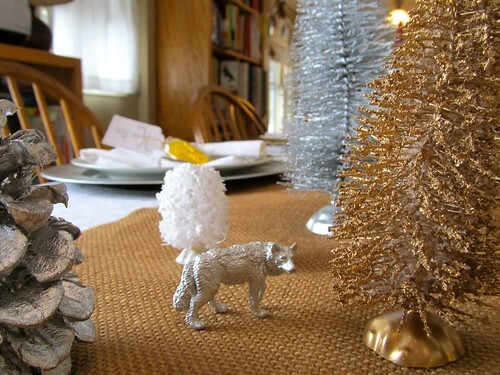 I enjoyed seeing all your silver and gold decorations. 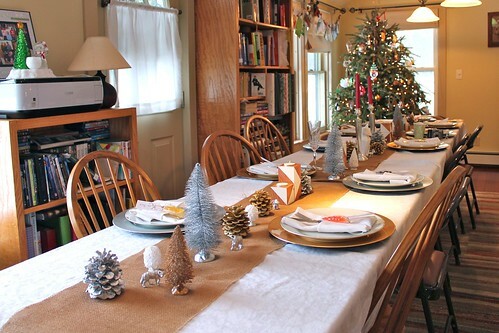 Those two colours look fantastic together and the table looked very modern and festive! You and your sister must have had such fun on this joint creative project. Well done, the guests must have loved it all! 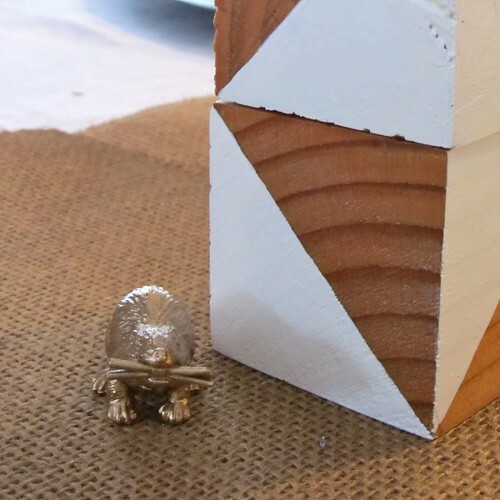 How lovely to find gold and silver painted cones to fit in, they do look perfect together! 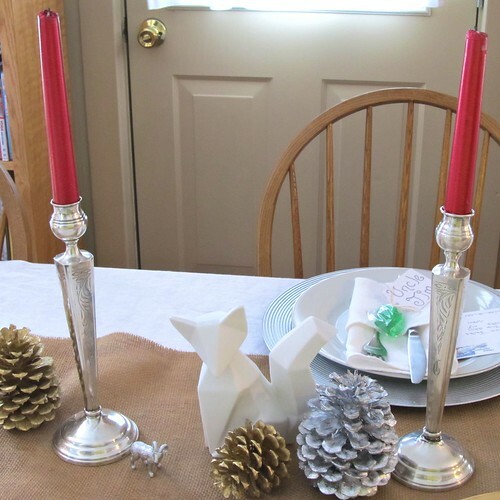 I love all the little touches you added to make the Thanksgiving decorations Christmas-y. It looks stunning. Those handmade lollipops must have been delicious!